SATs: Too Much, or Not Enough? Butterflies in your stomach, long lines of nervous teenagers, and a sense of impending doom… yes, that does sound very familiar. And with good reason. With the last SAT testing dates approaching, many juniors have been talking in hushed whispers and having nightmares about low scores crushing their hopes and dreams of being lawyers and engineers. Here, I wish to address the all-important question: What is the SAT, and does it really make a difference? Let’s start with the basics. The Scholastic Aptitude Test (better known as the SAT) is one among the national standardized tests that millions of juniors and seniors can take to measure their “aptitude” in three sections: Mathematics, Critical Reading and Writing. The College Board, which is a “not-for-profit membership association whose mission is to connect students to college success and opportunity,” develops these tests, which are then administered in high schools around the world. Most countries around the world have similar exams to determine who’s in and who’s out: France has the Baccalaureat, England and Wales have the GCSE, India has the CBSE and ICSE, and Germany and Finland use the Abitur tests. But, does the SAT scale up or scale down to international standards? 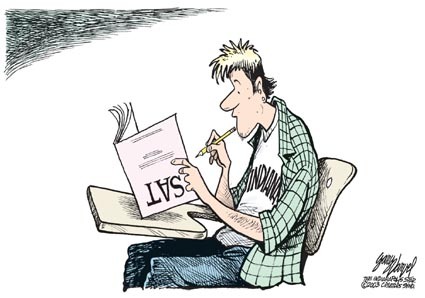 Aside from scores, there are several other criticisms surrounding the SATs (or, for that matter, ACTs and almost all other standardized testing subjects). Many argue that the cost ($45 without fee waivers) is high–and why does the College Board charge anyway, if it is a “not-for-profit institution”? Others argue that it, in fact, favors the wealthier classes–these students are the ones who can actually afford to take ludicrously expensive SAT prep classes to perform well on the exam. The scores also report an ethnicity bias– Asians and Caucasian students consistently score higher than their Hispanic and African-American counterparts, which is largely a reflection of their ability to access resources, test prep services, and undergo rigorous preparation to in fact take a test that doesn’t measure their aptitude at all. This is partly the reason why more and more colleges are moving to SAT-optional applications. Based on the data, I am pushed to draw negative conclusions about the SATs measuring actual knowledge. From 1972 to 2009, SAT scores have actually declined in most sections: Critical Reading scores dropped on average from 530 to 501, Math has seen a slight improvement from 509 to 515, and the Writing performance has slightly decreased from 497 to 493. And for this decline, I would largely hold accountable the organizations that in fact, generate the MOST revenue for College Board, ACT and other institutions–Kaplan, Princeton Review, and other test prep institutions. With the Joe Bloggs approach, more and more students taking the SATs have been able to figure out the “test” section, and by guessing the answers, have consistently underestimated the difficulty level for test-takers in successive years, thus statistically beating the College Board and lowering the standards. This is presumably why the SAT changed their name from the Scholastic Aptitude Test to Scholastic Assessment Test in 1996–what they are truly measuring is not a student’s aptitude to succeed, but rather an assessment of where the student ranks among all of his peers–the pool from which any college will be making its final pick for the Fall semester. US students have been found to fare lower than their Asian and European counterparts. So, how do the SATs measure up internationally? Turns out, not well enough. American students have been known to perform “averagely” on an international scale. Many countries, in fact, administer these tests very early, so students don’t have to undergo such rigors in their last years of secondary education. English schools test their students at a very young age for eligibility into “grammar schools”, Turkish end-of-basic-education exams determine admission to Anatolian math and science schools, and Germany is well-known for dividing up its students into three tracks as early as grade five! So maybe this early focus is the key to performing well on standardized tests is focusing these students at a very early age so they know what they are destined towards. In mathematics, on average, only one American student in five scores above the Japanese average, and only one in ten scores above the Singaporean average. Asian students continuously outdo American and European students in performances on almost all standardized tests. 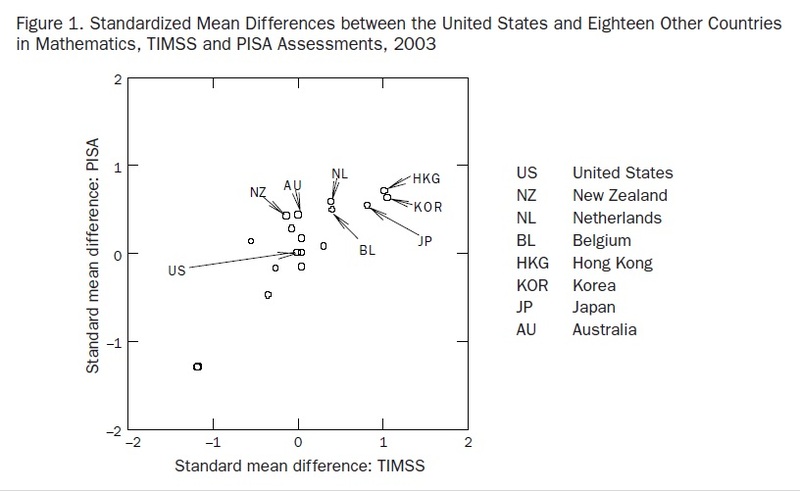 So, US students, taking the SATs, ACTs, or almost any other standardized test, are known to fare lower than some of our Asian and European counterparts.